1. Start with the camomile milk infusion. Place the milk and camomile tea together in a small pan and allow to come to a simmer. Remove from the heat, cover and infuse for 15 minutes. Pass the liquid through a sieve, reserving the infused milk. 2. To make the camomile sponge, in the bowl of a stand-up mixer fitted with a whisk, whip the egg and the sugar until light and creamy in texture. In the meantime, sieve all of the dry ingredients together. Begin adding the dry mixture, in 3 stages, into the egg and sugar, and mix until well combined. Add 125g of the infused milk and the vegetable oil. Place in the fridge and allow to stand for 24 hours. 3. For the fruit cup and berry sponge, in the bowl of a stand-up mixer fitted with a whisk, whip the egg and the sugar until light and creamy in texture. In the meantime, sieve all of the dry ingredients together (except the dried fruit). Begin adding the dry mixture, in 3 stages, into the egg and sugar, and mix until well combined. Add 125g of the infused milk and the vegetable oil. Place in the fridge and allow to stand for 24 hours. 4. For the camomile sponge, preheat the oven to 180°C, gas mark 4. Pour the batter into a greased and base lined 25 x 12cm loaf tin, and place in the oven. Bake for 30 minutes or until a toothpick comes out clean when inserted in the centre. Allow the cake to cool slightly in the tin. Remove from the tin and cool completely on a rack. Once cooled, trim off the edges of the cake and cut lengthways into 4 equal strips 2.5cm wide. 5. For the fruit cup and berry sponge, in a blender blitz the freeze-dried fruit to a fine powder. Remove the cake batter from the fridge and mix in the freeze-dried fruit and the fruit cup. Pour the batter into a greased and base lined 25 x 12cm loaf tin and place in the oven. Bake for approximately 30 minutes or until a toothpick comes out clean when inserted in the centre. Allow the cake to cool slightly in the tin. Remove from the tin and allow to cool completely on a cooling rack. Once cooled, trim off the edges of the cake and cut lengthways into 4 equal strips 2.5cm wide. 6. 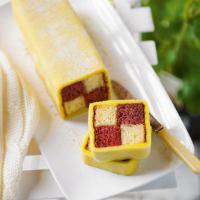 To assemble, roll out half the marzipan to a thickness of 0.2cm, and 21 x 38cm. Mix the caster sugar with the tea. Pass through a fine sieve and set aside. Spread the marmalade on all sides of the cake rectangles and sprinkle camomile sugar on all sides. Place a camomile sponge rectangle next to a fruit cup sponge rectangle and press lightly. Repeat the process, this time with the fruit cup sponge above the camomile sponge to give a chequered effect. Place the assembled cake in the middle of the marzipan and cover on all sides. Trim off any excess marzipan and the ends of the cake to neaten it up. Repeat with the remaining sponge rectangles and marzipan to make the second cake.